One of the best benefits of having a great company story video is how it strengthens your branding by showcasing logos, products and even color scheme in a positive light. Doing so humanizes your brand and creates positive emotions when done right. This improves your chances of being remembered when people are considering your products and/or services. 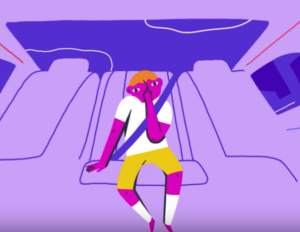 In the battle between Uber and Lyft, Lyft’s video is a simple explainer video with a pastel color scheme that relies heavily on their staple purple and pink. Maintaining a cohesive color scheme helps create a well-defined look-and-feel that feels very on-brand. A great company story video shows viewers how the company changes the world. Lyft isn’t just an app that helps you go places, in fact this company story video doesn’t mention the “app” once. Instead it uses animation to show viewers how Lyft is world-changing. Thinking big like this makes for a better performing video that people remember and are more likely to share. The visuals show how Lyft connects us, saves us time, pays us and even reduces our impact on the environment – something just about everyone can appreciate. How does Lyft’s company story video stand out in a sea of other videos? By not shying away from including topics like lesbians, walks of shame and nose-picking, of course. Lyft embraces these subjects, making for a fun video that forces a few smiles on your face and makes you say “whoa cowboy”. As with most animated videos, music can make them or break them. The music in the Lyft company story video adds to their story by subtly building up excitement while helping drive key concepts home. It starts off with no music, then simple notes play one at a time, slowly picking up speed as Logan gets the idea for Lyft, for example. From there, upbeat drums join in before the video ends with inspiring twinkling sounds as the voiceover suggests that the next great big world-changing idea may be thought of while in a Lyft. As companies look for more ways to share their stories, forward-thinking ones like Lyft are making animated videos that think big, tell great stories and are unique. Learn more about video marketing on our blog, and to get started on your own company story video contact us here.